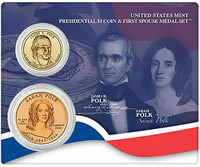 On Thursday, September 17, 2009 The US Mint will be releasing the 2009 Presidential $1 Coin & First Spouse Medal Set™ – James K. Polk - Sarah Polk. These sets consist of one uncirculated James K. Polk Presidential $1 Coin and a bronze medal likeness of the Sarah Polk First Spouse Gold Coin. Housed on a colorful illustrated card, both pieces help tell a story of the history of the United States. The James K. Polk Presidential Dollar goes on sale August 20th, 2009 from the US Mint. Available in specially marked rolls, the coins feature an image of Polk on the obverse. Each roll will contain 25 coins, either from the Mint in Philadelphia or the Mint in Denver. Rolls sell for $35.95 each, plus the Mint's $4.95 shipping charge per order.